Needy U.S. borrowers are defaulting on almost $1 billion in federal student loans earmarked for the poor, leaving schools such as Yale University and the University of Pennsylvania with little choice except to sue their graduates. The record defaults on federal Perkins loans may jeopardize the prospects of current students since they are part of a revolving fund that colleges give to students who show extraordinary financial hardship. Yale, Penn and George Washington University have all sued former students over nonpayment, court records show. 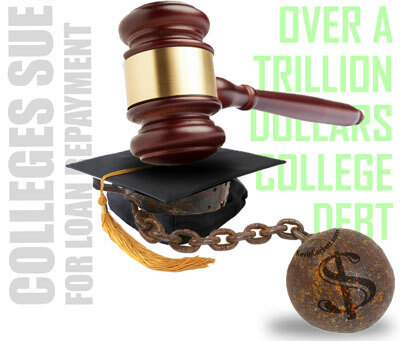 While no one tracks the number of lawsuits, students defaulted on $964 million in Perkins loans in the year ended June 2011, 20 percent more than five years earlier, government data show. Unlike most student loans — distributed and collected by the federal government — Perkins loans are administered by colleges, which use repayment money to lend to other poor students. The increase in the amount of defaulted loans among poor students comes as President Barack Obama says he wants to expand access to college for working-class families and increase funding for thePerkins program. Under his proposal, the pot for Perkins loans would increase to $8.5 billion from about $1 billion. The Education Department would service the loans instead of colleges. Aaron Graff, a farmer’s son from Denver, graduated from George Washington in 2010 with the help of $62,500 in scholarships over two years, according to his financial-aid award letters. He defaulted on $4,000 in Perkins loans. Graff, 30, said he hasn’t been able to find a full-time job. He earns $800 a month from teaching high-school equivalency courses and restores basements for extra money. He said he is trying to pay off otherstudent loans first because they were co-signed by his parents. “Perkins loans are issued from a revolving fund, so any monies recovered through litigation increase universities’ ability to help other students with education costs,” Candace Smith, a spokeswoman for George Washington, said in an e-mail. The university doesn’t comment on specific lawsuits, she said. The interest rate on Perkins loans is 5 percent, and students get a nine-month grace period after leaving school or graduating. In the 2007-2008 academic year, 64 percent of Perkins loan recipients reported parental income of less than $50,000, according to Mark Kantrowitz, who runs finaid.org, a website on educational lending. With college costs climbing faster than the rate of inflation over the past four decades, students have taken out more loans, swelling outstanding education debt to $1 trillion, more than what Americans owe on their credit cards. The University of Pennsylvania filed at least a dozen Perkins lawsuits last year, according to court records. Penn, based in Philadelphia, gave out more than $8 million in Perkins loans in the year ending June 2012, according to the school. Penn refers loans to a collection agency when they have been delinquent for 120 days. Michelle Brown-Nevers, an associate vice president, declined to discuss thresholds because she said she didn’t want to reveal collection practices. Yale is suing Elizabeth M. Triggs, who studied there between 2001 and 2006 and signed five promissory notes totaling $8,255 under the Perkins program, according to a filing in Superior Court ofNew Haven last year. Students who take out Perkins loans aren’t eligible for government income-based repayment plans when they run into financial trouble, unlike borrowers from the more popular Stafford loan program used by many middle-income families. Such repayment plans let students with high debt relative to their paychecks make smaller payments over time. Colleges can work with Perkins students to develop individual plans. The federal government also lets universities and debt collectors charge higher collection fees than Stafford when they pursue a Perkins debtor. On the first attempt, schools can charge 30 percent of loan principal, along with interest and late fees. They can charge 40 percent for the second effort and an additional 40 percent on litigation, according to the Education Department. The fees are higher than the 25 percent allowed for government-backed Stafford loans because the lower value of the Perkins ones makes them less appealing to collection agencies in terms of commissions, said Dan Madzelan, a former Education Department official. The University of California system tries to use its own personnel before suing Perkins debtorsbecause balances are relatively small, said Coolidge. When borrowers don’t have assets or income, winning a judgment doesn’t actually result in collecting the money, she said.